I obtained my Ph.D. in Mathematics from The Ohio State University in 1995 under the direction of Stephen C. Milne. After my Ph.D, I spent one year each at Ohio State and the Indian Statistical Institute, Delhi. Subsequently, I joined the industry, where I have been able to make a significant contribution to the teaching and learning processes of Indian schools. In September 2015 I joined the Indian Statistical Institute, Delhi, as a visiting scientist and since February 1, 2016, I am a post-doctoral fellow at the University of Vienna. I am interested in Special Functions, more specifically, hypergeometric, $q$-hypergeometric, and elliptic hypergeometric series, their multiple series extensions over root systems, continued fractions, orthogonal polynomials and elementary number theory. I am also interested in providing a discovery approach to Ramanujan's identities. For the last few years, after rejoining academia, I have been quite active in research. For my list of publications, click here. Here are the blog entries about some of my mathematics papers. My Mathscinet page (if you have access). Here are a few samples of my research papers. The first of these is my Ph.D. paper. The second is one I wrote while still working in the industry. The last two have appeared recently and were the result of collaborations in Vienna with Christian Krattenthaler and Michael Schlosser. In addition, I have recently submitted a paper with Mourad Ismail (UCF, Florida). I have a strong interest in expository writing. Here are two samples, both on Ramanujan's mathematics. Click here to see my series of articles with Punya Mishra, on communicating mathematics using Ambigrams. I have written a book for middle school math. Get Smart! Maths Concepts, Penguin Books (Imprint: Puffin), India, 2008. After my PhD, after a couple of years at Ohio State and ISI, Delhi, I joined the industry. I first joined the Center for Research in Cognitive Systems, NIIT Ltd's Research and Development wing. An interesting feature of this period was joint work with some famous educationists, including my boss, Sugata Mitra. At this time I wrote a paper on theories of education and how they can inform the development of technology for education. At NIIT, I was project manager for developing a course in Multimedia which was run as an advanced course in Kolkata. This eventually led to a book on Multimedia published by Academic Press. This is an edited volume, a collection of articles, of which about one-third were authored or co-authored by me. An Introduction to Multimedia Systems (co-edited with Sugata Mitra and Shikha Mehta), Academic Press, USA, 2002. The above led in a natural way to projects to develop rich media systems to assist learning in various contexts. After NIIT, I was the head of content development for egurucool.com, one of the first dot.coms in education from India. At Educomp Solutions Ltd., I was head of product development (content+technology) for the popular Educomp Smartclass project. I spent 11 years at Educomp, eventually becoming Senior Vice President and head of Digital Products and Solutions (DiPS). Here are two samples of mathematics learning objects made by my team in DiPS. Congruent triangles: A module showing the intuition behind the criteria for the congruence of triangles. The animations were done by a 3D artist. Volume of a cylinder: An activity showing the intuition behind the formula for the volume of a right circular cylinder. Here a real-life video was used to explain the key idea. Thousands of such learning objects were created over the years, covering all aspects of the school curriculum in all subjects. At the time I left Educomp, the product was being used in 10000 schools in the country. I have taught in several places, including at The Ohio State University, to MCA students in Delhi University's Department of Computer Science, in the Millennium School, even to children from the neighborhood in my garage. In recent years, I have been teaching a course on Mathematical Thinking in the Vedica Scholar's program for Women. I taught a similar course in Ashoka University's Young India Program. My teaching philosophy is simple. It doesn't matter how well I teach; what matters is how well the students learn. Since mathematics is learnt by doing mathematics (Halmos), I spend a lot of energy in devising ways in which I can get students interested in doing a lot of work! I believe in using computer algebra packages both in my research and teaching. I taught one of the earliest (circa 1994) undergraduate courses that used Maple as a graduate student at Ohio State. My current students are expected to work on Sage and other mathematical software. Here is an unpublished manuscript Experience Mathematics which arose after my garage problem sessions for high school kids in the neighborhood. Here are the lecture notes for Mathematical Thinking. More information is available on my teaching website which has information for my students. Amibigam Poettary: Accompaniments to some of Punya's Ambigrams. Diary entries: Articles of a more personal/autobiographical nature. 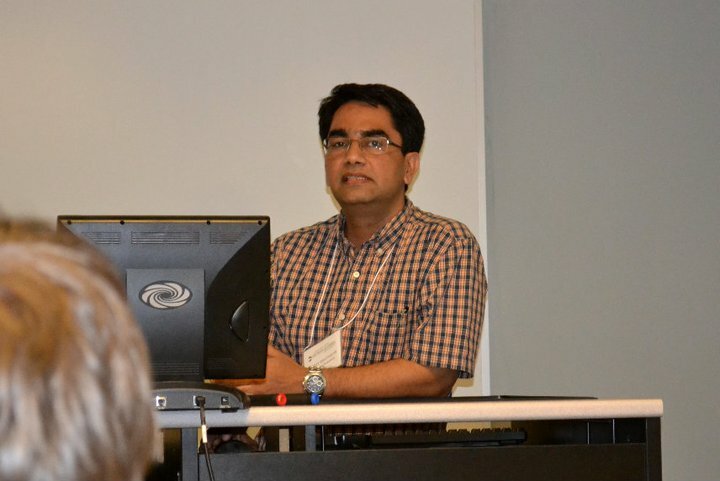 My picture taken by Hjalmar Rosengren in a conference on $q$-series in 2011. Address: Faculty of Mathematics, University of Vienna, Austria; 18 Chitra Vihar, Delhi 110092, India.